OrangeCD Catalog is the comprehensive music database program for cataloging your music on any media: CD, DVD, MP3, iTunes, OGG, FLAC, WMA files or even your old LPs and tapes. 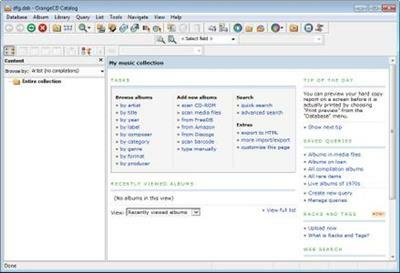 To add a new CD to the database, you just need to insert it in your computer or scan barcode from jewel case, and OrangeCD will download all information from FreeDB and Amazon databases, including cover image and album reviews. You don't have to type a single word. Filling your music CD database becomes quick and easy.